It is Library Lovers’ Month and I have to share my love of one very special librarian today. It is a repost from a couple of years ago but worth reposting because of the woman who tops my list as the best librarian and friend ever. We all have them. Those saints who have touched our lives and made a difference in all that matters in our world. People who make a difference without even trying. People who live in the moment and embrace each instant as an opportunity to give a little bit of themselves. I have many of these people in my life. After over a half a century of living I am happy to say that I have had a full life with many experiences and relationships with people who have made the difference. God willing—I will continue to have these relationships. 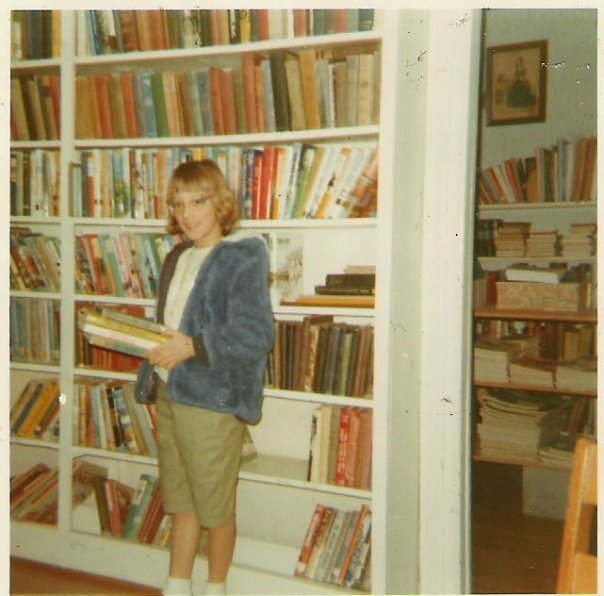 Perhaps one of the most important people in my younger years (parents and other family members aside) was a local librarian. Mrs. Irene Chandler was the librarian when I lived in North Fairfield, Ohio. Mrs. Chandler was an amazing woman and I know I use that word a lot but she was. She was not in the best of health, walked with a cane if I remember correctly and had some trials to overcome but she was the perfect person for a young girl to buddy up with. We moved to North Fairfield (current population 560) when I was going into 3rd grade and lived there through my 7th grade year. I had a paper route (Yay for the Sandusky Register!) and the library was conveniently on my route. I stopped in daily. My love of reading was fueled by Mrs. Chandler and she saw to it that I had the best selection of books in the tiny 2 room library. She loved me unconditionally. She saw something in that skinny stringy haired little girl that was special. Living in a small town and being the preacher’s daughter was not always easy but she saw to it that I felt good about myself and I found solace in the library. My papers always got delivered but there was always the afternoon stop to see Mrs. Chandler and get a book or two. She had a special drawer where she kept snacks. Many times she would insist that I take the rest of the bag of pretzels home or they “would go bad”. She spoiled me. But more than spoiling me she showed me love in a way that was real. She was an insatiable reader also and I still remember her telling me what books she loved the most. To this day I still call them “hysterical novels” because of her. Oh how I hope I am able to say that I had a lasting impression upon someone like Mrs. Chandler had upon me. She showed total acceptance and love and compassion for a little girl who did not always feel so great about herself. She showed love with not only her words but with her actions. When we moved from there I mourned the loss of my daily visits with her. Her daughter brought her to our wedding years and years later and I was thrilled to have her be there for our special day. I know that I have been blessed way more than I deserve to be in this life. I cling to those relationships with those who made a difference and I am grateful for each and every one. Today I think about Mrs. Chandler and hope that she knew just what a special person she was in my life. Posing at the North Fairfield, Ohio Library–aren’t I something? What a wonderful woman you described – I love that she impacted your life in so many wonderful ways. Mitchell, Allison and Leslie had a similar librarian at their elementary school. She loved reading, loved books and for some reason loved my kids – they all have special memories of how she made their days more special. We had a refugee family from Sierra Leone come to our church – when we discovered that the 3rd grader couldn’t read, this librarian (who also went to our church) sacrificed church service time for three years to teach him to read. That little boy is now in the US Army! Amen! I love your story as well. It seems there are some really amazing people out there in the world, aren’t there? Thanks for sharing! What a beautiful tribute to a beautiful woman. No wonder you adore books. She started me off with a love of libraries for sure. My parents always read to me and encouraged that in me so it makes sense that I would be drawn to libraries. great article and made me think of Mrs. Felix in Oelwein. She was a person that instilled a love of libraries in me that I still have to this day. See a lot of people have a Mrs. Chandler in their history. I love hearing about the folks who have made a difference. In medieval times a ‘chandler’ was the maker of candles for all levels of society and was considered a necessary and respected member of such. In naval terms a ‘chandler’ provided special items and stores for vessels making ready to sail. How appropriately named,was your Mrs. Chandler, as she provided a ‘light’ for your future and certainly provided you with some ‘special stores’ that would prepare you for your journey through life.. Kudos to Mrs. Chandler and you for her recognition. Oh gosh, Jake, that was pretty neat how how you shared what her name meant. It is true—she showed me compassion and love when I really needed it and sometimes you just need something extra than what your parents are giving—-family love is one thing but to be loved by someone who does not “have” to love you makes a huge difference. Thanks for your sweet words. I thought that it might have a bit of meaning for you. Sounds like a wonderful lady! You haven’t changed a bit. I had a grade 4 teacher who saw I was hurting and took me under her wing. I don’t think she knew it until I told her many years later but she saved my life. I am so glad you had her and that you were able to tell her later what a difference she made in your life. She probably had no idea what you were going through. It truly was a gift. I was her teacher’s assistant when I was in high school. Haha! I might have changed a bit. Don’t you love the fuzzy blue coat? I loved that coat. What a lovely tribute, Beth Ann. Mrs. Chandler sounds like a very special woman. How wonderful that she took the time to spend with you. I remember one of my high school teachers with a fondness like you have for Mrs. Chandler. Thanks, Jackie! She was a fabulous person inside and out and took the time to nurture a young girl. Can’t believe no one commented on that lovely picture of me! 🙂 You all are too nice. I agree that she was a very special lady who loved a little girl enough that helped her to feeo better about herself. Being the youngest in the family of 4 is not easy. Great memories of a grand childhood. I wonder if there are any of this kind of librarian around today? As far as your photo, didn’t we all look like that? I certainly did.